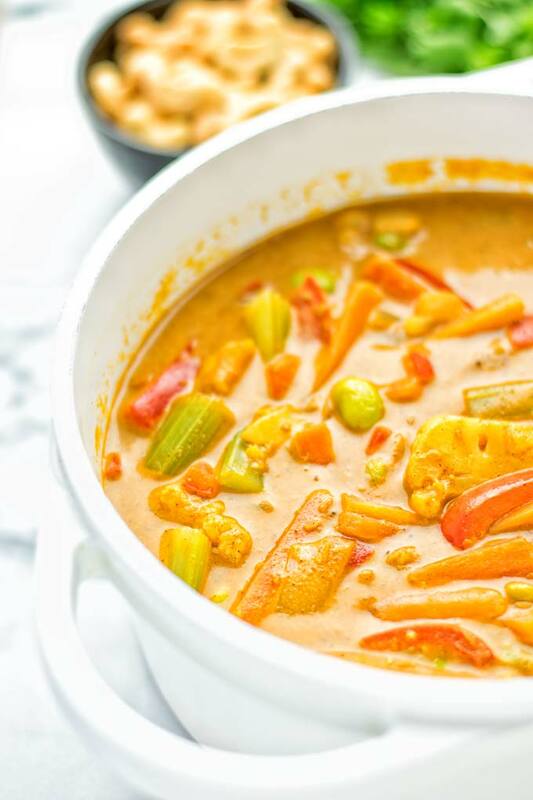 This amazingly satisfying Vegetable Korma is a one pot meal which is naturally vegan and gluten free. It’s really flexible and always delicious by adding your favorite vegetables so you won’t never get bored or tired of this. 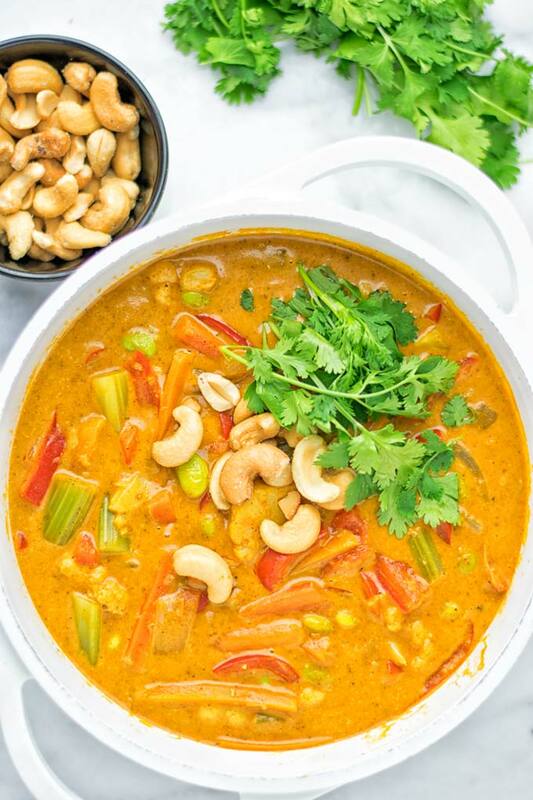 Curries are a regular staple in my house like this Lentil Chickpea Yellow Curry a must make infused with all the best flavors and so super easy to make in one pot. I’ve never get tired or bored about them. 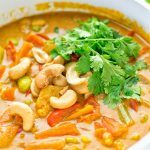 That’s why I fill my curry plates with different spices, like in my Coconut Cream Pineapple Curry, or curry pastes as in the Vegetable Panang Curry. 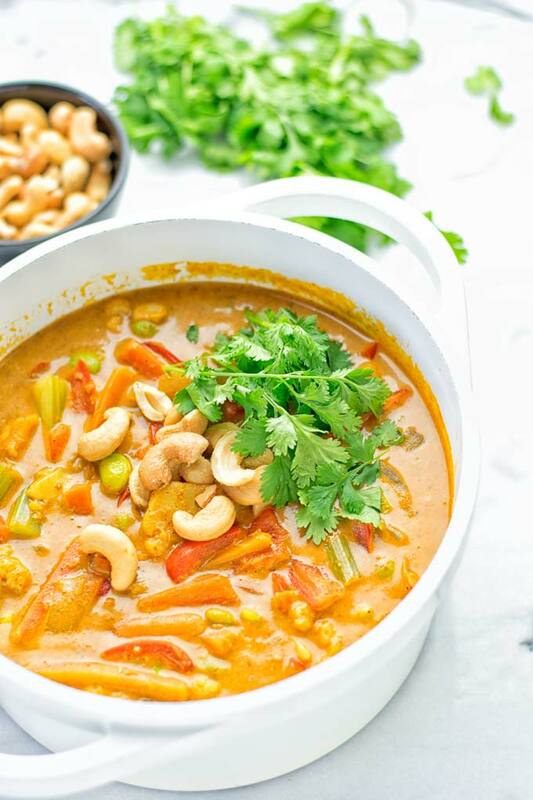 This Vegetable Korma is no exception. It’s super flexible. Anything goes, perfectly spiced from bottom to top. Super easy and quick, insanely delicious, mouthwatering, veggie packed, filling and a really satisfying one pot meal. You can make your curry with spices or curry paste. 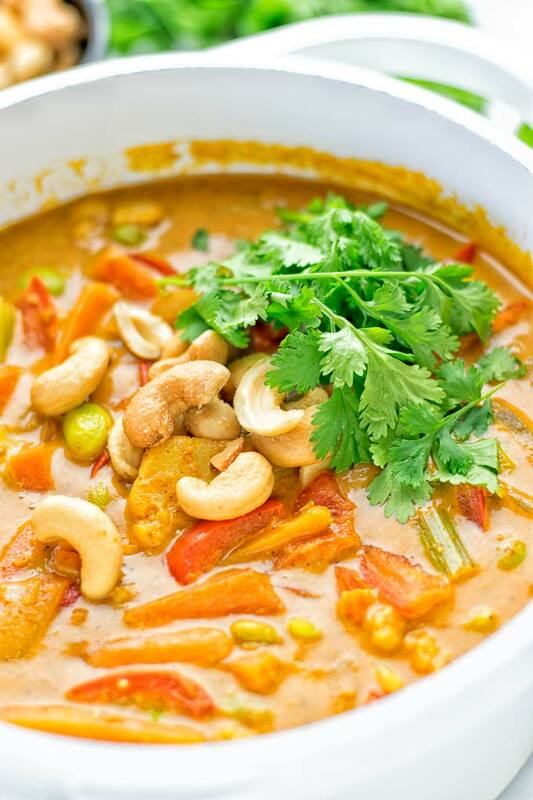 Think of green, yellow, red, or panang curry paste. But this one is different. We make this with korma curry paste. Korma is a bit milder than the other pastes, especially the red curry paste. What you add to a curry depends on your preferences and taste wishes. 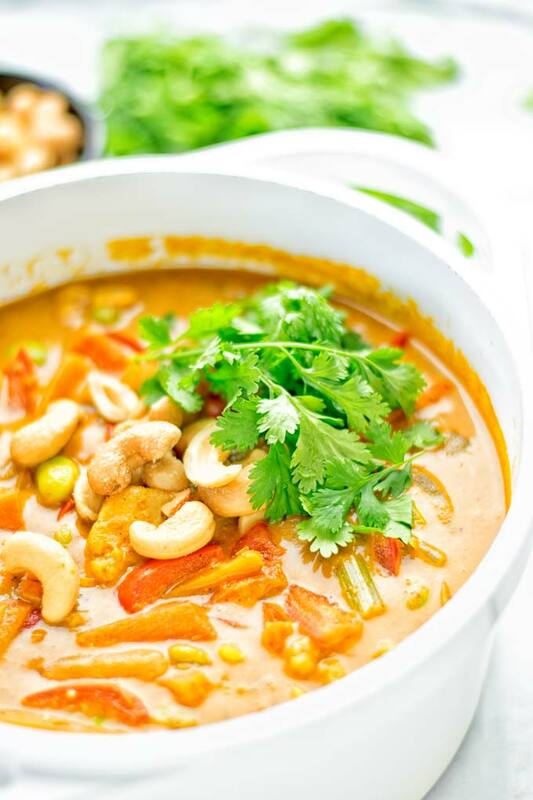 Many curries are made with chicken, seafood or beef, and are also made with butter and cream. Obviously that’s not plant based friendly. In my version I keep it really really simple as always. I used mixed vegetables like edamame, carrots, cauliflower, onions, celery, and bell pepper. You can be sure it works with all your favorite ones. There is no general rule, or anything like that. It’s all about being flexible and enjoy your curry like you want. Eggplants, zucchinis, broccoli, peas – to give you some more ideas. Seriously it’s so easy, absolutely no cooking skills required. I used both the korma curry paste and garam masala for the perfect curry seasoning. For my taste it was just the right amount of paste and spices. Feel free to scale up or down according to your preferences. I tried the Vegetable Korma without the garam masala. It was good, but adding it really takes the dish to another taste level. Please don’t skip it, it will turn out delicious but it will not have that flavor you can reach with paste and spices. Start with a bit of oil. Both coconut or olive oil is fine. For oil free cooking just use a bit of vegetable broth. Please make sure your oil or vegetable broth is hot. Add all the veggies and garlic. Fry all for around 5 minutes. That’s how to fry vegetables the right way. Next and last: add coconut milk, tomato paste, garam masala, korma curry paste. Cook for around 10 minutes more on medium heat. Serve in bowls or plates. Finally, and totally optional, top with roasted cashews. The Vegetable Korma is delicious plain. But if you are looking for a amazing and fresh naan bread try this Easy Roasted Garlic Naan which is on the table in 10 minutes! I guess it’s also really good with some pasta, yum. This is the easiest one pot recipe you can imagine. It’s all needed for a quick weeknight dinner, meal preparation, stress free work lunches and less dish washing time. I bought my garam masala at a local store. If you don’t find it, try online. If you’re looking for a new fun experience in your kitchen, make your own! All you need is a small skillet. Add a bit coriander, cumin, cardamon, mustard and chili peppers. Season with a good pinch of salt and pepper and roast for around 2 minutes. Do that until everything is lightly browned. Be careful not to burn the seeds. Finally, let them cool a bit, then transfer to coffee grinder or a similar attachment of your food process. Process until everything is smooth and blended. For the amounts use according your wished spice amount, use more cumin, less chili or more. This way you can find your right blend just for you. 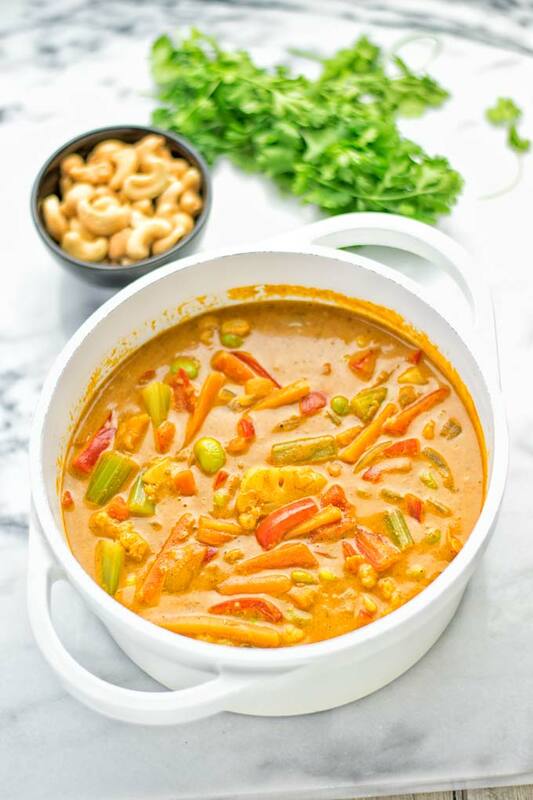 If you give this Vegetable Korma a go, let me know what you think on Instagram and Facebook. Add coconut milk, tomato paste, garam masala, korma curry paste. Cook for around 10 minutes more on medium heat. Serve in bowls or plates. What kind or brand of Korma paste did you use? I used a paste, not a sauce, vegan and gf one made from only natural ingredients. Brand will not help you much, I guess, since I’m in the Netherlands. This looks delish! I have looked all over town for Korma Curry Paste to no avail. I was able to find it on some websites but the shipping is SO expensive. Any suggestions for a substitute? Hi Megan! 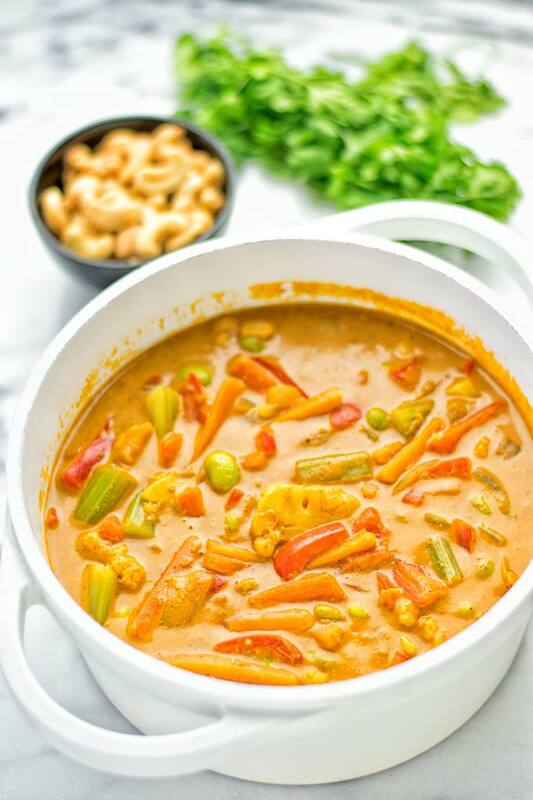 Try red curry paste! Let me know how it goes!